Remodeled ground floor unit allows strolling out your door to the pool, ocean, grills, or socializing with friends. Ideal for families who can let the kids run the grounds straight from the back porch. Windsurfers rig outside the door and walk to the water! This unit has new appliances, and a clean, inviting atmosphere. The bedroom has queen-sized bed, living room offers a pull-out sleeper sofa, and there is a guest twin bed. Sleeps up to 5 people. There are two bathrooms, one with tub, the other with shower. The condo has all standard appliances including dishwasher, disposal unit, microwave, washer and dryer, and blender (our favorite!). For entertainment there is a VCR, DVD, CD stereo system, and two televisions. There are two air-conditioning units - in bedroom and living room, and ceiling fans in bedroom and living room. Condo includes all linens, cookware and utensils. Winter stay - 10 night minimum. If you are looking for a clean, moderately renovated unit with comfortable beds and the major of the start up supplies you need then Marc's place will be good for you. He has always keep his rates fair so you don't mind having to deal with a few minor things. He always gets back to you right away and we have been renting here for many years because of the service and great location. The ground floor unit is at the rear of the complex and looks right onto the grassy courtyard with a peek a boo view of the ocean. 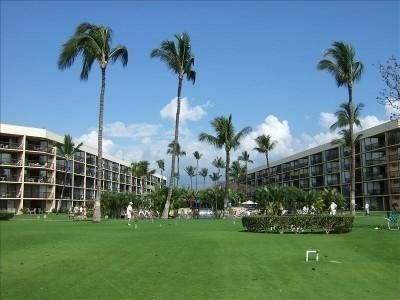 The maintenance staff at Maui sunset do an amazing job of upkeep on all the grounds and bbq's. Thanks again Marc for a great home away from home. Resort is great. We have stayed here a number of times now. Room is perfect! Perfect spot for our family. Great Family Unit with lots to do on Property. Unit was very clean and private. Marc has always been good to deal with, and already booked his place for 2020. Thanks to Marc for sharing his well equipped condo at a really special place. Pool and the bbqs, bocce ball and putting green, privacy, ground floor, easy parking--just a great spot.